June High 5 Moments at H5C! June is here and you know what that means… One step closer to the first day of summer here in the Northern Hemisphere! May flew by and brought High 5-ers new games, total of $33,759,097,814,866 coins in wins, and High 5 Casino’s 200th GAME! May started off with over 1,000 High 5-ers entering H5C’s Favorite Memories with Mom contest for the chance to win 200k coins! We loved reading each and every entry and choosing only 100 Winners was so hard! High 5 Casino also released four new games in May! The Lovely Outlaws: Ride Again a sequel to the H5C Favorite The Lovely Outlaws started the month off with over 200k spins! Followed by Pride and Prejudice H5C’s take on the famous novel! Our 200th game, Double Dinosaur Deluxe which offered the Double Dinosaur Deluxe Mission where 200 players who reached game level 200 by 5/25 were awarded with 2 MILLION free coins. And ending the month with All That Cash: Easy Money a combination of All That Cash and Green Machine two H5C Favorites which leads to HUGE wins! 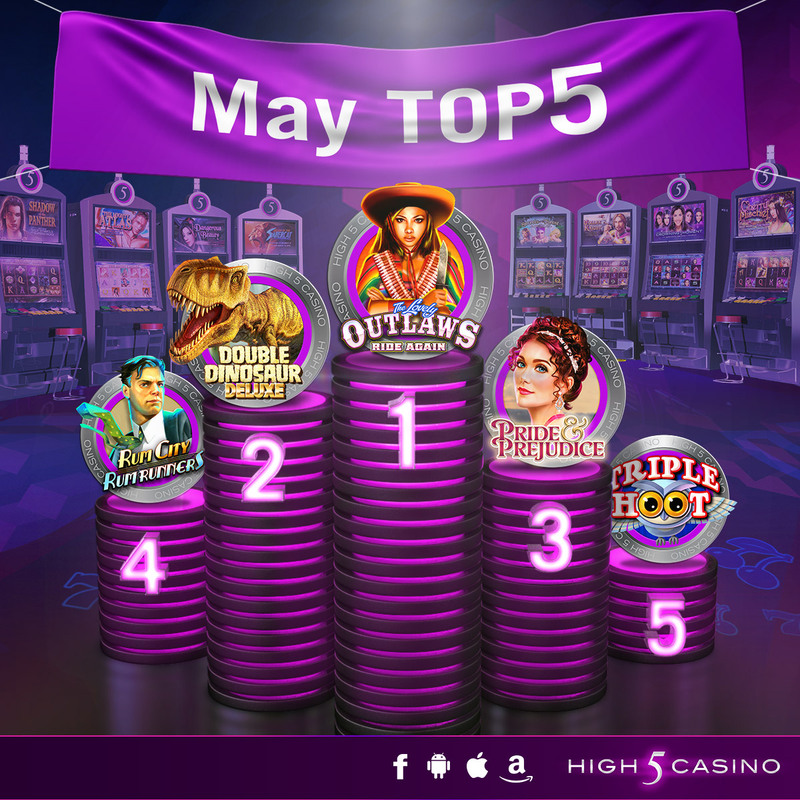 Top 5 most played games for May: The Lovely Outlaws: Ride Again, Double Dinosaur Deluxe, Pride and Prejudice, Rum City: Rum Runners and Triple Hoot! Which game gave you your High 5 Moment in May? Did you enjoy our 200th game Double Dinosaur Deluxe? Comment in the conversation bubble located on the top right corner of your screen and let us know! This entry was posted in H5C Stats, High 5 Casino, High 5 Games, statistics and tagged Android, App Store, Apple, Facebook, Free Games, Google Play Store, High 5 Casino, High 5 Casino Mobile, High 5 Games, iOS, iPad, iPads, iPhone, iPhones, mobile gaming, slots, social gaming, statistics by hoothigh5. Bookmark the permalink. I really like Double Dinosaur.